Shopping for bedroom furniture can sometimes be a mundane task with a vast amount of choice. Look no further…we’re here to make it easier for you with the Toulouse White Painted double wardrobe. 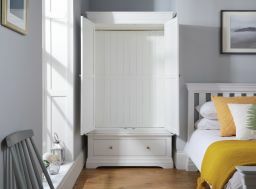 There are a number of reasons why we are confident this white painted wardrobe will tick all the boxes. 2. Has a spacious drawer, which is 87cm wide, 39cm deep & 18cm tall. 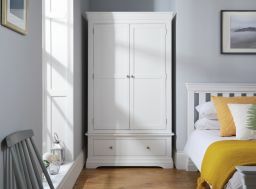 Please note that this wardrobe requires some assembly for the larger top section which has now been added as an optional paid service on the checkout page for most postcodes. 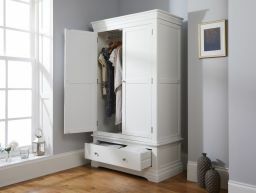 The lower drawer unit of the wardrobe comes fully assembled but the upper section would be too large to deliver into most homes if it came fully assembled within a box. Overall Dimensions – The wardrobe is 111cm wide, 57.5cm deep and 192.5cm tall. Amazing quality. Looks lovely, very pleased. Thank you again. 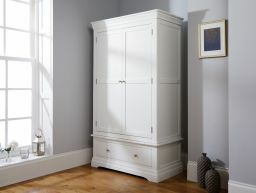 I was pleased to receive a very sturdy farmhouse white wardrobe. The delivery men Drew and Bri were very polite and efficient. I would suggest, that the wardrobe could be improved if, the top was secured firmly to the drawer base on construction. The magnetic door closers are a little strong. These are small issues that I can easily adjust myself. The wardrobe makes a great addition to my guest bedroom. Beautiful detail. Very spacious inside with a strong metal rail pole. Big draw very deep and also spacious. The company are very professional. Even when viewing items, someone was online to answer any questions we had. Free delivery and we live in Liverpool. Arrived very well packaged and in excellent condition within the agreed 14 days. We were notified of delivery time and date. Driver arrived 10 minutes early. Great! Highly recommend if you are looking for beautiful bedroom furniture. Excellent quality for money.